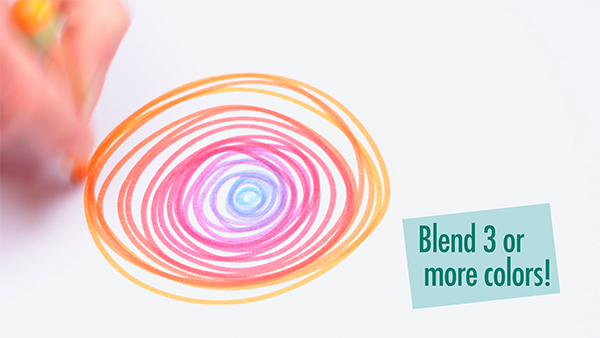 Blendy Pens: Color-blending art marker kit. 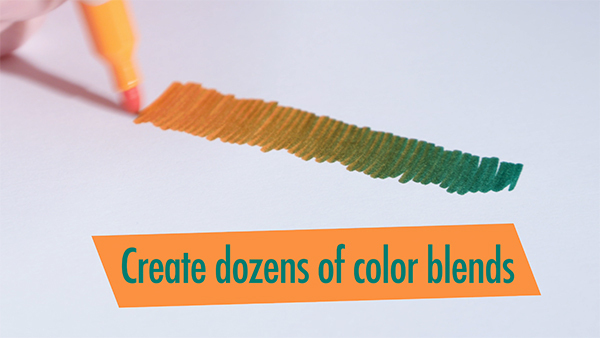 Change up your coloring game and use Blendy Pens to introduce a whole spectrum of hues to your artwork. Each felt tipped pen behaves like a conventional marker for standard coloring jobs. But these pens were also made to transfer pigment, opening your palette to a new kind of coloring. 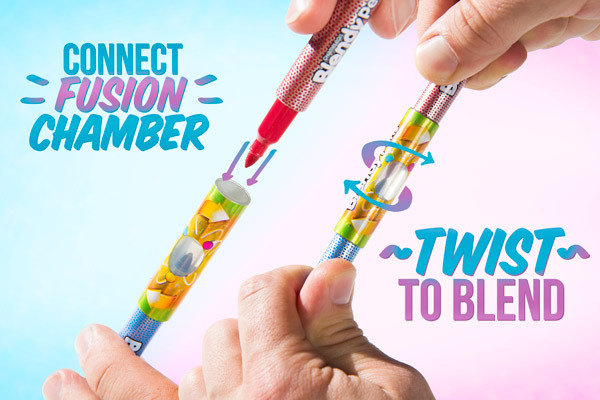 Connect a pair of Blendy Pens to the fusion chamber, give them a twist, and let the colors mingle. The moment you touch a blended pen to the page, you'll see a synthesis of pigments. Scribble to fill in a section and see an amazing gradient of color appear before your eyes. The marker gradually returns to its original color, ready for you to blend it again! From children expressing their creativity to adults finding their zen with meditative coloring books, artists of all ages have sought to get the most out of their coloring markers. 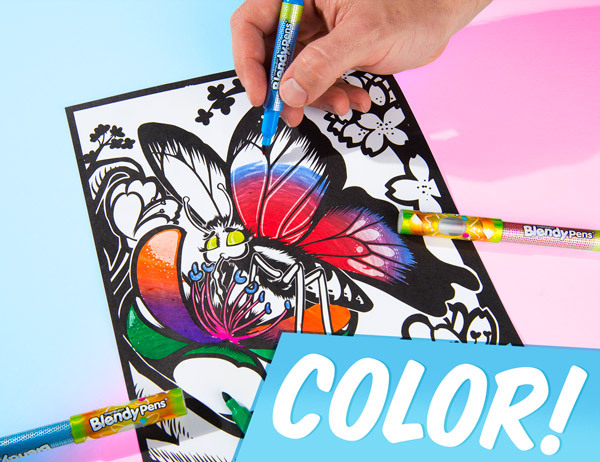 Blendy Pens bend your expectations of what a coloring marker can be by creating gradations that wouldn't otherwise be possible. They empower colorists to extend their creativity and make amazing, beautifully vivid art. 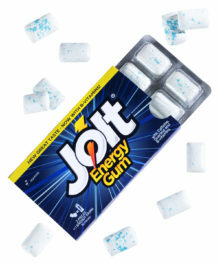 It's also super fun! Get super soothed as Joey colors in this picture with Blendy Pens. To create a color blend with a Blendy Pen, insert two markers into the fusion chamber (which doubles as the cap) with a satisfying click. Then twist the pens' barrels to get the felt tips to touch. The markers will exchange dyes, and each will temporarily be imbued with the other's color. Remove a pen and begin coloring to see navy transform to teal, green, and chartreuse before returning to the marker's original yellow color. The transition is so smooth, it looks like magic. Click and twist to temporarily change a marker's color. Creating a beautiful gradient of color makes Blendy Pens amazing. And so does their innate ability to return to their original hue and fill in areas with vibrant color. So go ahead and create amazing color transitions. Then fill in the details with swatches of solid color from a set of pens that feel great and color just as well. 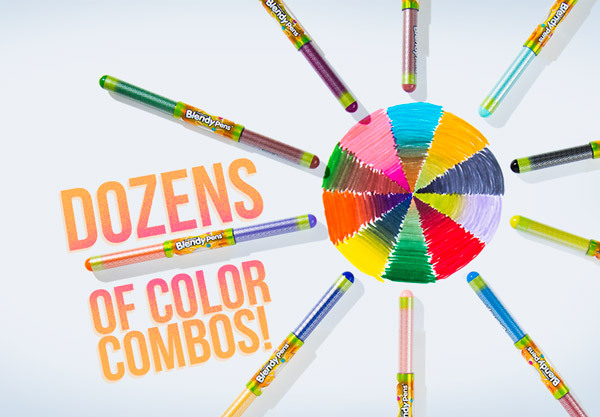 Blendy Pens are available in sets of either 20 markers or 6 markers. 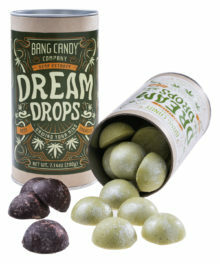 In either case, you can twist and blend them together in a myriad of combinations to create a whole crowd of new colors. 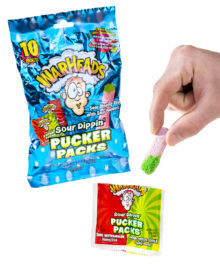 It’s a fun way to expand your palette without expanding the size of your marker box. Find new spokes in the color wheel. 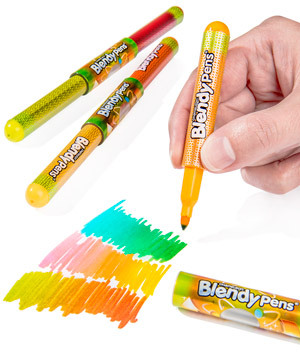 Blendy Pens amazingly allow you to temporarily mix two colors to create a third color. But the fun doesn't stop there. 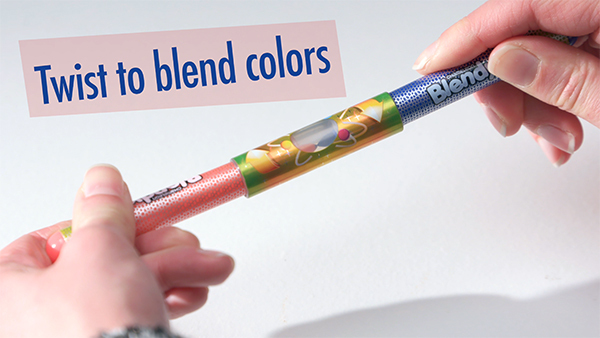 You can blend that blended pen with another pen to create yet another color. And then do it again. Blending colors up to four times, you can transition from color to color to color as you mark on the page. 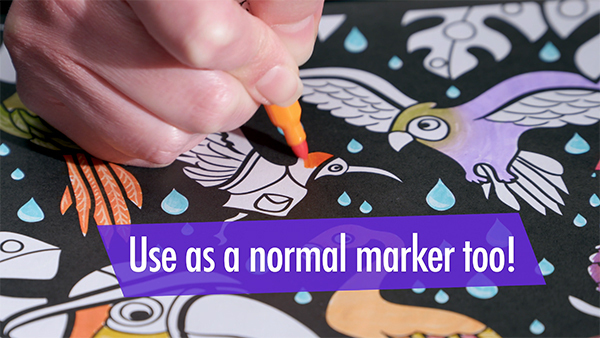 Everyone knows markers—even ones as special as Blendy Pens—are for marking. But they're also capable of creating swathes of color without ever touching the page. 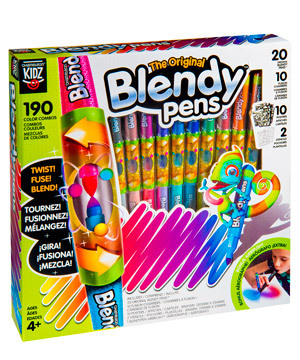 The 20-Pack of Blendy Pens includes a breath-powered airbrush that enables you to blow the color from your pen onto your paper with a different texture than marking. Simply snap a marker into the holder, breathe in, and exhale through the tube on the airbrush to push droplets of pigment onto the page. Use the airbrush to blow pigment onto your art. 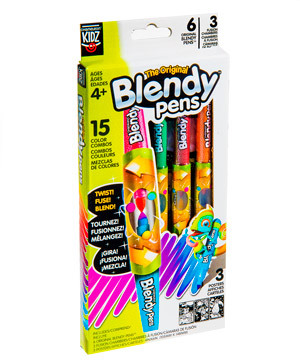 Blendy Pens are available in two styles: a 20-Pack and a 6-Pack. 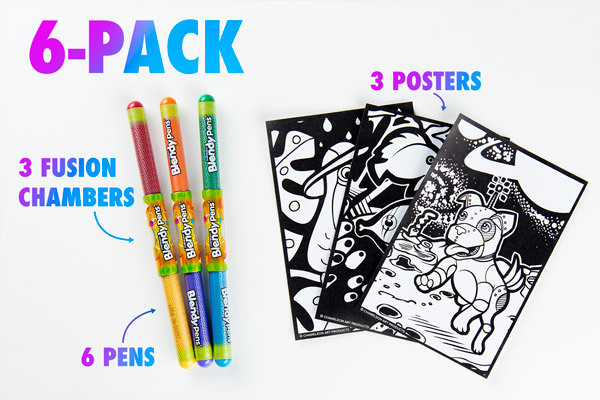 The 6-Pack of Blendy Pens includes 6 pens, 3 fusion chambers, and 3 coloring posters. 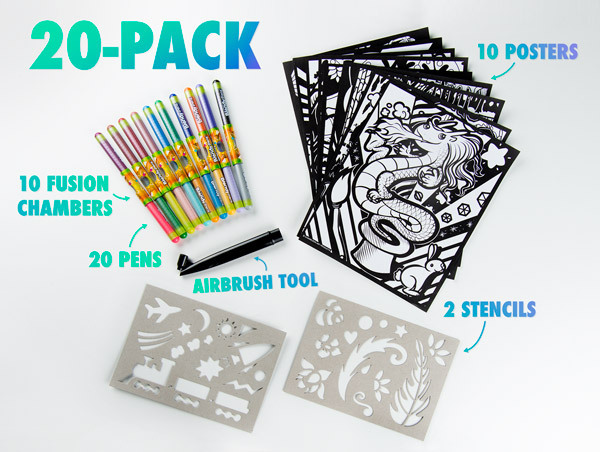 The 20-Pack includes 20 pens, 10 fusion chambers, 10 coloring posters, 2 stencils, and an airbrush tool. 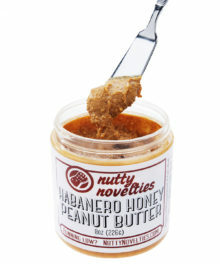 Not listed but included: dozens and dozens of color combinations. Question: Is the change permanent? 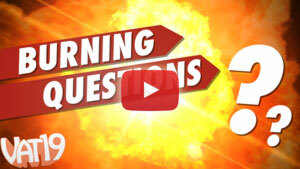 Answer: The blend will remain on the pen tip until it is marked on paper. Then the markers will revert to their original colors. Question: Does blending stain the marker tips? 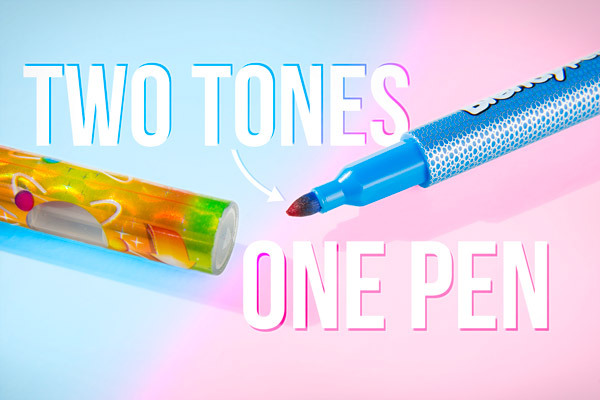 Answer: It's possible that some ink might remain on a tip if it hasn't touched the paper, but the marker tip will still be able to color with the same vivid tone as the original once all of the blending has been used up.